Starring: Paul Dano, Zoe Kazan, Annette Bening, Antonio Banderas, Steve Coogan, Chris Messina, Elliott Gould, Deborah Ann Woll, Toni Trucks, Aasif Mandvi, Alia Shawkat. After 6 years, husband-and-wife directing team Jonathan Dayton and Valerie Faris deliver their long-awaited follow-up to the brilliant “Little Miss Sunshine“. It would seem that the director’s were in no rush to emulate their previous, Oscar winning, success; preferring instead to wait for the right script. It would also seem that that time has now come and it’s, certainly, been worth the wait. Calvin Weir-Fields (Paul Dano) is struggling writer who once wrote a ‘genius’ novel when he was 19 years old. The trouble is, he’s now struggling for material and suffers from writer’s-block. 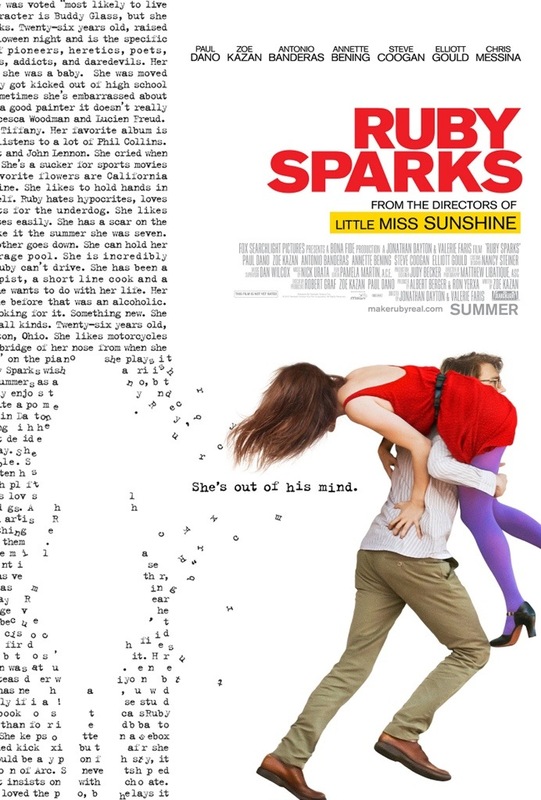 On the advice of his therapist (Elliott Gould), he begins to write about a girl that has been appearing in his dreams: Ruby Sparks (Zoe Kazan). The next day, Ruby becomes a real person and they both strike up a beautiful and loving relationship. What Calvin then realises is, that if he can will her into existence by writing about her, then he can change her at any time and make her do what he wants by writing more. Not many films built around romance have had the audacity to explore the very nature of love itself and the stipulations that seemingly come with it. It’s a genre I’m not fond of but that’s only because most are catered for the masses. This film dares to explore the complexities of a relationship and the stipulations that both sides make. It questions whether we can really love a person, wholeheartedly, without their indiscretions ever becoming irritating or intolerable. It also addresses the nature of dominance within a relationship and how that, in itself, is destructive. Therein lies the beauty and honesty of this film; it’s not afraid to pose these questions and it’s also not afraid to explore the darker elements to it’s premise or get it’s hands dirty when it needs to. After a gentler, more romantic-comedy beginning, filled with wonderful touches of light and observational humour, the denouement takes a brave, impressive and twisted dramatic turn, that shows the darker side to the fantasy. Wisely, the film’s fantasy premise is never explained. This may irk some viewers but really, the film wouldn’t have gained anything by trying to break it down. Quite frankly, it just wouldn’t have worked but that’s testament to the filmmakers, the terrific ensemble of actors and most importantly Zoe Kazan’s highly original screenplay as they all have you believing in them, even when you know you shouldn’t. Once you’ve accepted the premise, you can sit back and enjoy the excellent performances all round; Dano, once again, displays his more than capable acting chops with a character that is often, and cleverly, likened to writer J.D. Salinger and wonderful comic-relief comes in the form of Bening and Banderas as new-age hippie parents. The biggest surprise is from the screenwriter and eponymous Zoe Kazan though; she brings a real warmth and creativity that manages just the right balance and allows her to flit in-between moods with ease. Without such an endearing and understanding performance, the film wouldn’t have worked as well as it does. With excellent performances all round, and a great mixture of humour and pathos this is one of 2012’s genuinely surprising highlights. Like “Little Miss Sunshine” before it, this is a real treat. This entry was posted on December 12, 2012 at 2:57 pm and is filed under Comedy, Drama, Fantasy, Romance with tags 2012. You can follow any responses to this entry through the RSS 2.0 feed. You can leave a response, or trackback from your own site. Given your rating and review, I need to see this. Thanks, Mark. Yeah, I really liked it Michael. I didn’t expect much from it but sometimes that’s the best way to approach a film. I might be being slightly generous with the rating but it’s certainly no less than 4 stars. Thanks man. Great review Mark. Heard a lot of good stuff about this but haven’t had the chance to check it out yet. It seems like such a simple story (i’m sure similar things have been done already), but often those are the best. Thanks Chris. It shares a similar fantasy element like the Tom Hanks movie “Big”. You need to accept the premise if the film’s going to work for you. Thankfully, I accepted this one and it turned out to be a little gem. Happy to hear you also enjoyed this…I really liked it to, very original and entertaining. One more people should see. Thanks Nostra. I enjoyed it a lot more than I thought I would. 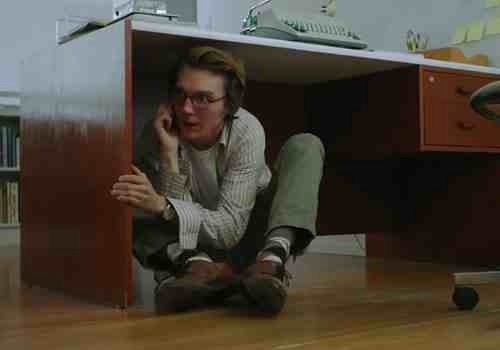 I’ve still to catch up on some films from 2012 but this is definitely a highlight so far. Just wonderful. Lovely review! I must say I’m not a big fan of Little Miss Sunshine but since this one is a love story, it appeals a bit more to me. Seems like something I may enjoy watching during Christmas time so I’ll try to see it! Thanks Sati. You don’t need to be a fan of Little miss Sunshine to enjoy this as the stories are vastly different. I only compare them in their originality but this husband and wife directing team look like the real deal after this. I hope you get a chance to see it. very excited to catch this one, I feel like Kazan will probably be my favorite part of the film from what you say. Great review! Cheers Andy. Kazan is great in it and very endearing. I didn’t expect much from this but it delivered plenty. Delightfully original. I think I know where from this comes. Imagine your an actor being told how to feel, which way to turn, to be good or bad and just when you’ve got it down and memorized….They hand you a rewrite. Zoe Kazan had it and heard it all I’m sure, so this is her paean to freedom and wholeness and being who you are. She’s incredible to watch. Can’t say the same for Dano. He seems to bring the same persona to every character he plays. Sometimes annoyingly so. I think you’re probably spot on there Ray. That’s a good way of looking at this film (and characters) creation. Sorry, you didn’t Dano. I thought he was great. I always enjoy Dano’s performances. I mean, he’s went toe to toe with DeNiro and Day-Lewis and came out unscathed. I thought everyone was great in this film though. Somehow this was one of the few movies that I didn’t see at the theater. I am a “Theater Junkie” after all, or so I’ve been told. Ha ha. But I’ll definitely check it out based on your glowing review. Thanks Mark. It’s definitely worth a shot. Like I’ve said to others, I went into it rather cold and not expecting much but it delivered on many fronts. Hope you like it as much as I did. I’ll keep an eye out for your review. I hadn’t realized Faris and Drayton directed this. Little Miss Sunshine had one of the best endings I’d seen in a long time. I was all smiles when I saw it in the theater. This goes on the list. The Duplass brothers produced. They’re known for their low budget, hipster “mumblecore” movies. Don’t let the hipster tag throw you off. Safety was a gem of a movie. Also it has ome nice cameos you don’t expect in a low budget movie like this. I mostly hate romcoms as you can probably guess. Stuff like Amelie, Richard Linklater’s After Sunrise/Sunset/Midnight Trilogy and anything by Brits Richard Curtis and Nick Hornby is more my style. Let me know what you think if you get around to it. The zither scene it particularly good. Yeah, it’s the same director’s Dave and it’s another winner. Like you, I don’t normally go in for Rom-coms but this dares to do things differently… And succeeds. Nice review, Glad you liked this one. Eager to check it out. Big fan of a lot of the people involved. Definitely a highlight from what I’ve seen so far this year Fernando. Hope you like it man. Yes a real treat indeed. I don’t get to watch many films with my wife but when I had a chance I recommended this as one to her…I knew she would love it which she did. It targets every emotion and the one that’s the most surprising was sorrow. Couldn’t agree more man. It was brave enough to tackle all sorts of emotions and my good lady enjoyed it also. She’s normally quite critical of films I recommend but on this occasion it worked. Thanks again man.